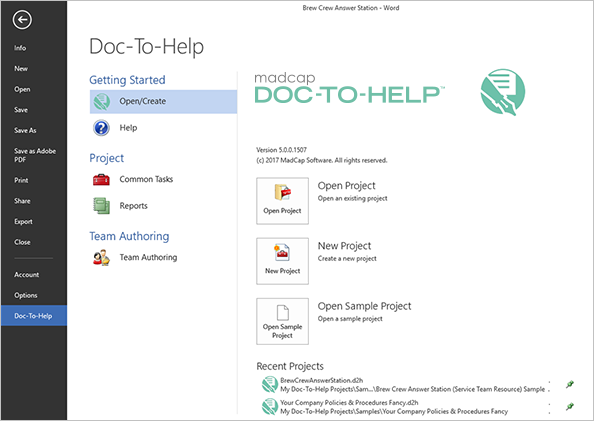 With each new release of MadCap Doc-To-Help, we want to streamline your ability to manage and publish policies and procedures documents, online help sites, and more, all without having to leave Microsoft® Word. 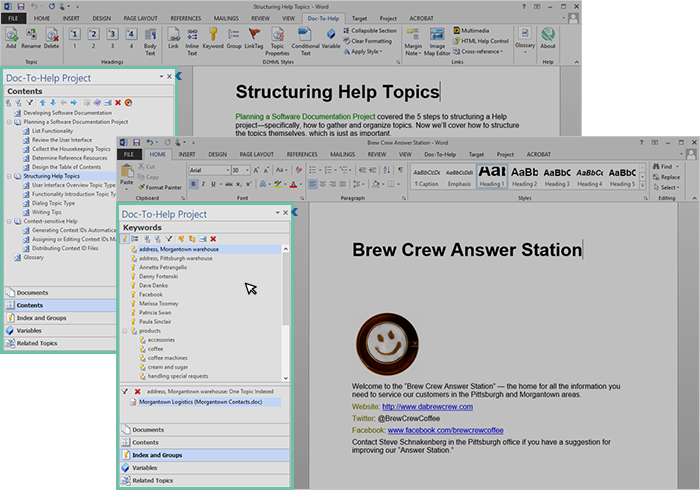 We’re excited to share the latest release of Doc-To-Help, which adds all-new enhanced Microsoft® Word integration, a new menu in Word to access Doc-To-Help features and resources, two new ribbons to access Project and Target-related features, and several other new features to help streamline the authoring process. Getting Started: Open existing projects, create a new project or open a sample project. You can also view the Help system, as well as download PDF guides, view video tutorials, and download updates. Project: Access the Common Tasks submenu to schedule builds or access the Reports submenu generate any number of reports available in Doc-To-Help. Team Authoring: Access the Team Authoring submenu to connect to a team project, share a project or review and edit your web repository settings. The new Project Ribbon gives you quick access to project settings and functions directly from the toolbar. In addition, the Project Ribbon also includes commands that let you apply attributes and styles to your Doc-To-Help project. Targets can be added, built, and published within the new Target ribbon. 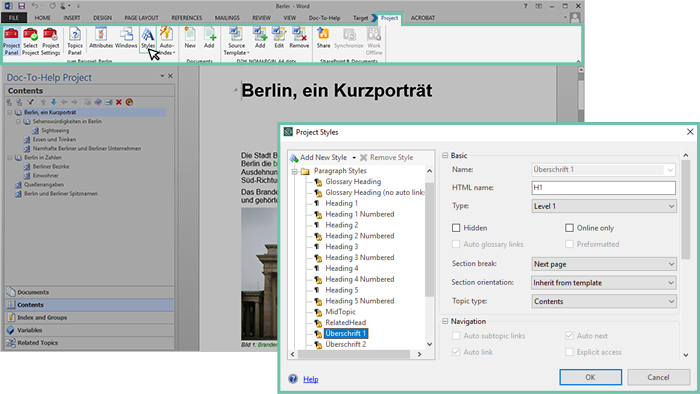 You can also rebuild and schedule builds, modify the themes of the project, and manage target templates within Word. The redesigned Doc-To-Help ribbon has been streamlined, making it easier to access commonly used features and commands straight from the toolbar. With the new redesigned ribbon, you can add and edit topics, insert headings, modify styles, add links and glossary terms, and more. Related topics is a powerful feature in Doc-To-Help, as it allows you to customize relevant “See Also” Links on a topic without the need to create individual cross reference links. With the new feature, you can now manage Related Topics directly in Word, with the embedded panel that now includes the “Related Topics” view. For more information on the new features and enhancements, View our What’s New topic page. Want to see the new features in action? You can register for our webinar on next week, covering the new features and enhancements that comes with Doc-To-Help 5. As is the case with all of our products, you can get started with a free, fully-functional 30-day trial at any time. Our technical support team is available to answer any questions by phone or email as you evaluate. Additionally, we can schedule a private demo to provide a personalized overview, as well as discuss any needs or questions you may have. We hope you enjoy the newest release of MadCap Doc-To-Help! If you have any questions, feel free to reach out at jbondoc@madcapsoftware.com. Justin Bondoc, Sales Engineer II, started at MadCap Software as a technical support engineer and turned to the evangelism team to promote the value of MadCap Software’s products and services to the community. In addition to spending his time educating potential and existing customers about all things MadCap Software, Justin likes listening to hip-hop, tackling his next art project, and exploring his creative side.